Improving the design of your website is the first thing to do after setting up your blog. Whether its a portfolio site or a WooCommerce store, you must always look for the loopholes in your design. One of the basic things to do is make your website design responsive and provide your visitors with a clean UI. WordPress plugins are known to improve the dynamic functionality in WordPress, but it can also be useful for web designers. Here are some helpful WP plugins to save time and boost your designing performance. Vectr is a free plugin from the WordPress directory and helps in embedding user-friendly graphics. This plugin offers a live preview screen for creating on-page design. You can use it for website logos, infographics, watermarks, banners, collages, and annotated images. Vectr adds the designed images directly to the page via one-click. Coming soon plugin is great especially for those who don’t have time for designing an entire page when putting the site on maintainance mode. You can use either the coming soon page while you create a few designs for your portfolio, or put the site under maintainance dialogue when working on the backend of your blog. Coming soon and maintainance mode plugin is designed by web factory ltd, they are known for offering a smooth interface in the plugins. Its design is similar to that of the premium visual composers, so you won’t have any problem in finding page elements. Envira is an image hub for web designers. It lets users create responsive photo and video galleries for their WordPress website. This gallery plugin is optimized for mobile, tablets and the desktop version of a page. It is a pre-optimized gallery with a faster server. The DigitWidgets plugin is a popular WordPress extension for changing a web designer’s dashboard into a professional image editor. This helps in live image designing. You can use DigiWidgets for changing pictures in any manner with filters, layer transformation, and text box additions. It is helpful for creating template boxes for effective content representation. WP Retina creates full-size, retina-ready images for your design pages. 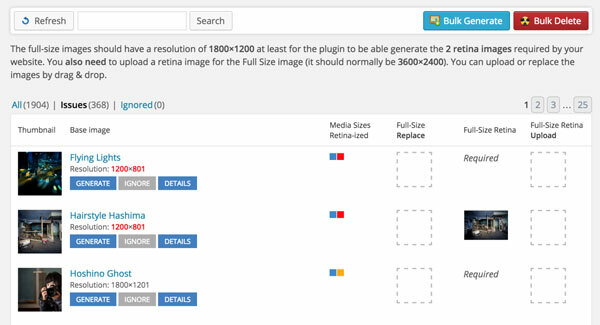 Image files built with this plugin are useful for High-DPI device display. You can save much time with this extension. It creates a clean and crisp appearance for your visitors. These plugins will not only make your website visually appealing, but also improve your sales, conversion rate, content read time, course registrations and so forth. Above plugins are great when you have a business website, but if you have created an online boutique store, you might need a few more additional plugins from WordPress directory or envato marketplace. Author Bio: Pulkit is a WordPress writer and web design, enthusiast. He loves helping people with website growth and content management. When he is not writing for tech sites or design blog, he can be found discovering new WordPress tools.